1 – What is your view on post Brexit Britain – positive, negative or indifferent and why? I’ve always said Britain is great at inventing stuff and making stuff. It’s in our bones. As a nation, we are at our best when we have a common goal and are working together with a bit of “you can’t do it” thrown in to make us angry enough to prove everyone else wrong. We’ve always been a trading nation, so now we have to rediscover this and get out and sell our amazing inventions to the rest of the world. We’ll be just ﬁne. I know the answer to this one! I’d invest it in people, both current and future. Firstly, I’d reward the loyal people who stuck with me in those early, difﬁcult years when there was lots of risk and they weren’t rewarded as well as they should have been. Secondly, I’d recruit more talented people to our growing team to help us realise our potential both here in the UK and abroad. 3 – How do you think the manufacturing community can collectively continue to engage and interest young people in manufacturing careers? The manufacturing community should continue to highlight that careers in the industry are stimulating, fun and never boring. There’s never been a better time to join the manufacturing sector because of the 4th Industrial Revolution. It may not be quite as glamorous as the X-Factor but with simulation, automation, robotics, 3D printing and the Internet of Things (IoT) all coming to the fore, there’s never been a better, or more exciting, time in our industry. I had no idea what I wanted to be at school but I come from a long line of engineers; my grandfather was a textiles engineer, my father a mechanical engineer, my older brother is a mining engineer and my younger brother is an agricultural engineer. I guess I just drifted into it and, in light of not knowing any better, I chose Mechanical Engineering at UMIST when I was 18. The rest is history. 5 – Any wise words, advice or tips for someone looking to pursue a career in manufacturing? There’s great training available out there from many manufacturers, so make the most of it. Get a solid foundation by taking the time to listen and learn your craft, then have the conﬁdence to bring new ideas and methods to the table. Manufacturing is crying out for change and you are in the right place at the right time to do it. Oh, and have fun along the way! 6 – What one thing would you change to make your business more efficient and productive if money was no object? This is a luxury question as money always is an object, but it’s made me think. Simulation is the answer. As a new, innovative business, each market segment we enter (whether it’s milk, yogurts, cakes, cartons or aerosols) has slightly different requirements. To manufacture the right machine for the job in the traditional way, we have to design it, build a prototype, test it, evaluate it, improve it and keep going through this routine until we get it right. If we could do this through simulation, our time to market would be massively improved. We have a project proposal with the Manufacturing Centre of Excellence (MTC) to create a machine speciﬁcally for aerosols and they have all the software necessary to do the simulation for us. I can’t wait! 7 – If you could choose, what would you like your legacy to be once you retire? 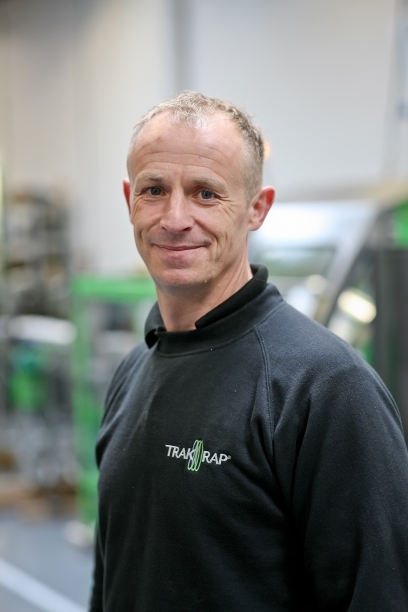 That’s easy, I’d like Trak-Rap to be known as the worldwide leader in lower cost, more environmentally friendly packaging for the grocery industry. Oh, and for it to be known as a great place to work. 8 – What is your morning routine once you arrive at the factory/office, does this depend on the day of the week it is? Monday is our team meeting day. We have a great communications area with all our Key Performance Indicators (KPIs) on the wall for us all to see. Everyone in the factory attends and I love the fact that I don’t own it, they do. We go through all the KPIs – Health and Safety, Team, Compliance, Commercial and Customer Service – and literally everything comes out, good, bad and ugly! Fortunately, as a team we are also good at ﬁnding solutions and getting things done. I’m a big believer in sharing everything – including the ﬁnancial side of things – because we win or lose as a team and it’s everyone’s responsibility. This is my only routine day, but it sets the tone for the whole week. I am absolutely certain that the quicker we embrace it, the more successful UK manufacturing will be. It also means it’s the most exciting time to have a career in manufacturing. We have a short-sighted view of productivity centred round making more stuff with fewer people, and utilising existing machinery because it doesn’t owe us anything and we don’t think we can afford to upgrade it. But productivity is much bigger than that. The digitisation of the manufacturing process is going to allow us to: optimise machinery and processes, through simulation, in double quick time; shorten response times to customer demands; and improve product quality, ﬂexibility and efﬁciency, all at a lower cost and with data shared via the Internet of Things through design, planning, engineering, production and services. This is the new productivity equation and not investing in new machinery and processes will simply not be an option. 10 – What’s one thing you have implemented in your business that you would encourage other manufacturers to embrace and implement? Phew, these questions are tough! If you have the chance to start from scratch, as I did, I’d recommend implementing a customer-led culture that isn’t hierarchical and encourages everyone to have their say and get involved. We do a lot of problem solving using models like DMAIC (Design, Measure, Analyse, Improve and Control) and we always involve the entire team; it’s amazing how many times a great idea comes from the least experienced people! Oh, and I’d put Health & Safety at the heart of everything.